I grew up ten miles outside of Grass Valley, California, a Sierra Nevada foothill town in the heart of gold country. Dad taught high school special Ed. Mom was a librarian, a second grade and then a middle school English teacher, so most of my early memories feature blackboards, books, dusty, deserted playgrounds, and bigger kids who were mostly tolerant and kind, in a dismissive sort of way. I adored them all but idolized Jeanne, a tall, freckled blond girl in my older brother’s class. Jeanne was bigger than most of the boys, faster too, and her knees were branded with the most exquisite collection of bruises I’d ever seen. Jeanne taught me how to dribble a basketball, how to elbow my way into games, how to play through bloody noses, how to go get the ball when the boys wouldn’t pass to you. I wanted to be Jeanne, but any playground respect I might have earned as her understudy was undercut by the fact I was a teacher’s kid, and a crier, and too eager to please for my own good. It also didn’t help that I loved to play make-believe with another, distinctly uncool faction of kids who became my lasting friends. Although I eventually grew to love reading, I never imagined I’d write books. At ten I dreamed of two things: playing NBA basketball with Magic Johnson, and singing in Star Makers! a junior high song and dance troupe complete with sequined leotards and tap shoes. One of these dreams came true, but I have burned all video evidence. I did enjoy some success on the basketball court. At any rate I performed well enough to earn a scholarship to play at Saint Mary’s, a small, division one college on the west coast. We won a lot, which was great, but I was undersized and rarely played, which wasn’t great. It also became clear in my wretched first year that I was not cut out to be a pre-med student. (I thought athletes were competitive!) After fumbling around a few semesters I found a home with English majors, many of whom also wrote squalid little poems and stories in beat up notebooks, and what’s more, admitted to doing so. After college I studied writing on a Rotary Scholarship at the University of Aberystwyth, Wales. Here, with the naïve confidence of a novice, I decided to write a novel, and set about it with an athlete’s bullheaded determination, blocking out time and showing up each day whether I felt like it or not. 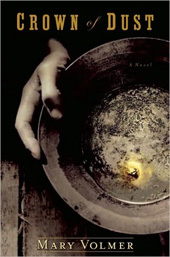 In fiction I found a medium appropriate for the outsized emotions that had always plagued me. The best thing about books—writing or reading them—is that you’re invited to feel and think deeply with, and for, other people. Even people who never existed, or who lived hundreds of years before. I also tried my hand at acting in Wales but my first role as a mad lawyer in the Duchess of Malfi was also my last. The whole venture felt too much like sports, with a coach or casting director determining whether I would get to play. Editors, those literary gate keepers, can say no, but they can never stop you from writing. Probably my folks imagined I’d go away for a year and get this writing thing out my system. Instead I returned to attend my alma mater for an MFA. A year later my first novel, Crown of Dust, was published. Now after marriage, my first full time job, and a baby, and a few spectacular failures, my second novel--Reliance, Illinois—has finally endured that treacherous sophomore road to existence. I’m working on a third. 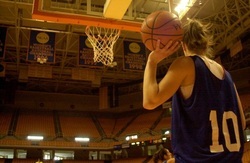 I love this photo... At practice at the University of Tennessee before the second round of the 2001 NCAA Tournament. We beat Texas, but Pat Summitt's Lady Vol's proved too much.